One of the best ways to help keep your swimming pool healthy is to keep your chemical levels on target. One way to do that is to purchase a Waterway Clearwater In-Line Chlorinator. Waterway has been serving swimming pool owners for many years now. One thing is for sure; Waterway has a huge inventory of high quality products that would be a welcome addition to your swimming pool. There are so many different styles and types of chlorinators on the market that it can be challenging to find the one that best suits your needs. The main factor that you will want to look at when purchasing an in-line chlorinator is safety and reliability. You want to make sure that the product you use will provide a safe amount of chemicals to your swimming pool. You will also want a product that can offer 100% reliability when it comes to performance. The Waterway Clearwater In-Line Chlorinator offers a clean and safe way to sanitize your swimming pool. This product can offer the perfect levels of bromine or chlorine. Let’s take a look at this in-line chlorinator and see why these products are used by thousands of swimming pool owners all over the United States. 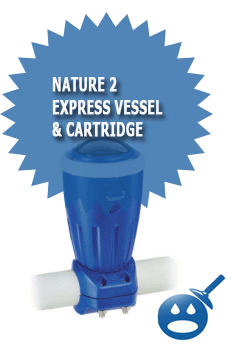 Some of the features offered by the Waterway Clearwater are the 1-1/2 inch inlet and outlet, making installation easy. There is a 1-1/2 inch hose barb adapter included as well. 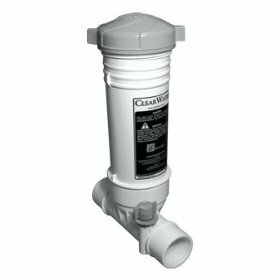 This system comes with a 6″ extension that works with sand filters. You will find an internal chamber that was specifically designed to make this in-line chlorinator a high performance product. One of the requirements of this product is that it must be permanently installed onto your swimming pool’s return line. This chlorinator is not a floating chlorinator or an off line product. If you were thinking of something more portable then this is not the unit for you. In order to operate this system you will have to open the inlet valve, turn on the pump and filter and check for leaks. The installation is easy and you as a pool owner can do it yourself. There are some in-line chlorinators that you need tools just to place the tablets inside. With the Clearwater System you simply rotate the lid clockwise and refill with the tablets or sticks. Let the fumes escape and place the tablets inside. Make sure that the O-Ring is clean before tightening the lid. Operation of the Waterway Clearwater In-Line Chlorinator is easy and if you have any questions, the manuals are easy to read. 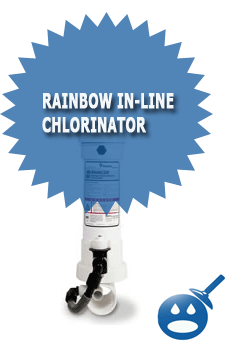 This In-Line Chlorinator is a durable and 100% reliable chlorinator. There is a flow valve that is used for regulating the levels of bromine and chlorine. By using this valve you can get a more accurate reading. This in-line chlorinator has a tablet capacity of 12 large tablets or 100 small tablets. Even the dial on the chlorinator has been relocated to help seeing the levels easier. This sanitizer can treat 12,000 to 48,000 gallons of water. You can use this chlorinator on both the sand filters and D.E Filters. There are installation instructions for each type of filter. The best part about these in-line chlorinators is that if you need a replacement part then the parts are readily available. You will be able to find the complete replacement chlorinator as well as the Clearwater Lid, O-Rings, Valve Stem Assembly and Bushings. There are plenty of websites that offer these replacement parts. You can shop around for the best pricing. Waterway has been in business for over 35 years. In their 35 years their quality of products has met and exceed the industry standards. There are so many ways to keep your swimming pool healthy but you have to find the right products. 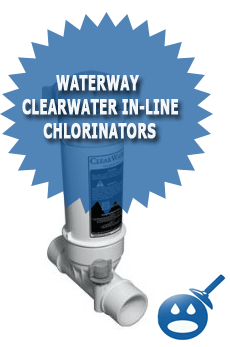 Starting with a Clearwater In-Line Chlorinator from Waterway can help a lot. The price of these in-line chlorinators is about $75.00. Read all of the instructions and directions before attempting to install this product. There may be certain restrictions or requirements that you may need. Waterway has a great reputation for high quality and high performance products. Start looking for a safe and effective way to keep your swimming pool healthy. I have a waterway chlorinator which was installed with the pool in 2002. I have a part which is leaking. Looking at the cutaway diagram, it looks like part # 8, but mine has a rubber connector on it, and the rubber split, causing water to shoot out. Whar is this part called and can I get a replacement for it? If the Chlorinator is from 2002, I would just replace the whole thing. Chances are once you replace that part another will fail. 7 + years is a good lifetime for a Chlorinator. I have a Waterway Chlorinator that was installed two years ago. Recently, the water flow to it has stopped considerably. The water level in it will slowly drop until the chlorinator is dry. Any ideas on how to fix this?? Maybe try cleaning it out. Could there be a small piece of Chlorine maybe blocking one of the port holes? I have seen that before. If there are no cracks in the chlorinator, I would replace the part only. I have seen chlorinators last for 20+ years. The model number should be on the sticker on the unit. I have a Waterway L14518 that need the stem valve, #7 on the chart. Where can I find one? j’ai un chlorinateur qui aura 2 ans et la partie caoutchouc du robinet de réglage et deja usée et elle empeche de tourner la vanne de debit de chlore. Je suis dans le sud de la France et je cherche un distributeur de pieces détachées pour ce type de chlorinateur. Chlorinator L14518 needs new stem valve. Is this part available? Cost? How to order? I just installed a waterway clba012 inline chlorinator but it is very noisy sounds like the check ball rattling is this nnormal? do I need the check valve? I need to replace the stem on my waterway chlorinator where can i find the instructions to do so? is there any step by step booklet?